Well, it was a link between M1 and Stirling Corner. D'ya know what. I figured that out all by myself. Enough with the sarcasm! Be remotely useful for once. OK then. Stirling Corner is a roundabout where the A1 and the A411 meet between Borehamwood and Edgware, on the border between Middlesex and Hertfordshire. Not surprisingly, this was meant to link that junction to the M1. Well, where would it have met the M1? There is no junction 3! Yes, I know. Well, that's not strictly true, is it. Junction 3 is there almost entirely intact, it's just not signed, and doesn't go anywhere useful. Except London Gateway (nee Scratchwood) Services, of course. Oh hang on a minute - that's what the stupidly awkward entrance to the services is all about then? If you look on a map or an aerial photo, it's clear that the entrance to London Gateway Services is made up of 80% of a roundabout. Coming from the north, you head up the sliproad, then turn awkwardly right, heading the wrong way around the roundabout. Then, if that's not enough, you get to a strange junction purely designed to try to get traffic that's just come the wrong way around the roundabout back to the correct side of the road. It's an absolute conefield, and it's amazing that nothing has ever been done to fix the mess - save for allowing northbound traffic to miss out the roundabout entirely. It's not as if the fix is particularly difficult either. Just finish the flippin' roundabout, OK? It's not that hard, surely? Yes, you're probably right. Now what's the history here? Well, the first proposals for the Stirling Corner Link turn up in the late 1950s, when the M1 was still planned to head all the way to Marble Arch. In 1961, the Link was part of the firm proposals for the Hendon Urban Motorway - or what we know as the M1 today between Watford and the A406 North Circular Road. Indeed, if you look at that section of the M1 today, it's remarkably quiet, even at peak hours - simply because all of the junctions south of Watford point away from London. No traffic heading from London can exit the motorway until it gets to Watford. You're not allowed to escape! The Stirling Corner Link would have changed all that. Indeed, there are maps in existence that show a fork junction to and from the south only rather than the roundabout as constructed. Well, half-constructed. For some reason that I haven't yet got to the bottom of, it wasn't constructed along with the rest of that section of M1 in 1967, but it still appers in the roads programme all the way to April 1976 - but by August of that year it had been cancelled in the public spending cuts of the time. And that should have been the end of the story - and indeed as far as the motorway link was concerned, it was. However, the road would not stay dead forever. In 1989, the then-Government announced Roads for Prosperity, a sudden return to the roadbuilding programmes of the past. Hidden down amongst the "all-purpose schemes" was the Stirling Corner Link. Renamed, of course, to the Scratchwood Link just to keep us all on our toes and although it was planned to be a three-lane wide dual carriageway, it was not to be a motorway scheme. The Scratchwood Link was one of the schemes put out to private tender in April 1990, but progress in getting the road constructed was non-existent and the road itself was re-cancelled in the cuts of 1994, seemingly never to return. Can I see a map of the motorway? 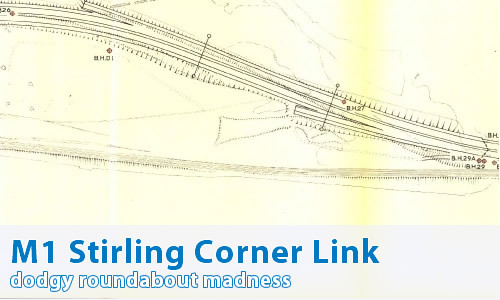 There's one on the Might Have Been Map - though it should be noted that the layout changed over time and some maps show the Link joining directly on the Stirling Corner roundabout rather than the layout shown.